Let \(ABCD\) be a convex quadrilateral with \(\angle DAB = \angle BDC = 90^\circ\). Let the incircles of triangles \(ABD\) and \(BCD\) touch \(BD\) at \(P\) and \(Q\), respectively, with \(P\) lying in between \(B\) and \(Q\). 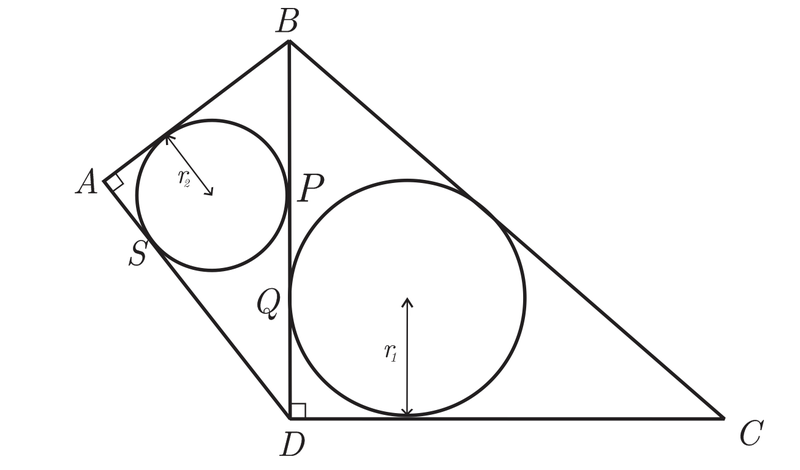 If \(AD = 999\) and \(PQ = 200\) then what is the sum of the radii of the incircles of triangles \(ABD\) and \(BDC\)? From the figure we can see that \(SD = PD = PQ + QD = r_1 + 200\) and \(AD = AS + SD =r_ 2 + SD = 999\). Let \(O_1\) and \(O_2\) be the incenters of \( \bigtriangleup DAB\) and \( \bigtriangleup CDB\) respectively. Draw perpendicular from \(O_1\) to sides \(AD, DB\) and \(AB\) at points \(S, P\) and \(E\) respectively. Draw perpendicular from \(O_2\) to sides \(CD\) and \(DB\) at points \(F\) and \(Q\) respectively. Let \(R\) and \(r\) be the inradii of \( \bigtriangleup DAB\) and \( \bigtriangleup CDB\) respectively. \( SO_1EA\) and \(FO_2QD\) are squares with side \(r\) and \(R\) respectively. Since \(DP\) and \(DS\) are tangents from the same point they are equal in length.